Cyclists in the City: "Sixties relics" to be ripped out and made safe for cycling. Major funding announced to make 33 of London's nastiest junctions safer. "Sixties relics" to be ripped out and made safe for cycling. Major funding announced to make 33 of London's nastiest junctions safer. In 2011, together with my cycling partner in crime Mark Ames of ibikelondon blog, we set off with several hundred people on a “Tour duDanger” – a bicycle tour of central London’s most dangerous junctions for cycling. We had only expected a few dozen people to turn up. In the end, we were joined by London Assembly Members, MPs, film crews and many hundreds of people who simply wanted to say they'd had enough of these terrible junctions. The point behind the ride was to highlight the insanity of the large junctions dedicated only to the fast movement of motor vehicles that are dotted all around inner London. People are largely an afterthought in these environments and yet 10s of thousands of people have to cross these junctions on foot or on a bike every day. At the time, we were met with fairly little sympathy. The Mayor, notoriously, stood up and proclaimed that the horror of the twin Elephant & Castle five lane roundabouts was just fine thank you very much, telling us that “Elephant & Castle is "fine [to cycle around]...if you keep your wits about you”. Serious numbers of people are seriously injured each year trying to cross the road or pedalling around these junctions on a bike. And most of these junctions act as a huge barrier – people look at them and think that driving or taking the bus is going to be a much more sensible way to get across them than walking or biking. Don’t forget, for example that the twin roundabouts at Elephant used to be a nightlife hub for the whole of south London. Now they are just giant areas for moving motor traffic where most people would rather bus or drive than cycle or walk. So it comes as a massive boost to see the Mayor nowdeclaring that junctions like the Elephant “blight and menace wholeneighbourhoods”. He made this statement as part of a commitment to rip out of 33“Sixties relics” and spend on average £9millon to redesign each of them. I’ve seen the initial designs for a couple of these “relics”, for example at Oval junction and they’re not bad. They need a bit of tweaking but the stunning thing about the latest Oval plans is they could just about make this place workable for your 14 year old to bike to school without having to fling themselves across multiple lanes of accelerating motor traffic. My bet too is that by redefining spaces like Oval junction, the Mayor can help turn some of these areas from urban wastelands (frankly, that’s what many of them are: no shops; no one really wants to be there except people who have to be there; barriers between communities) into proper nodes where people want to be again. This has all come about as something of a change of heart at TfL. 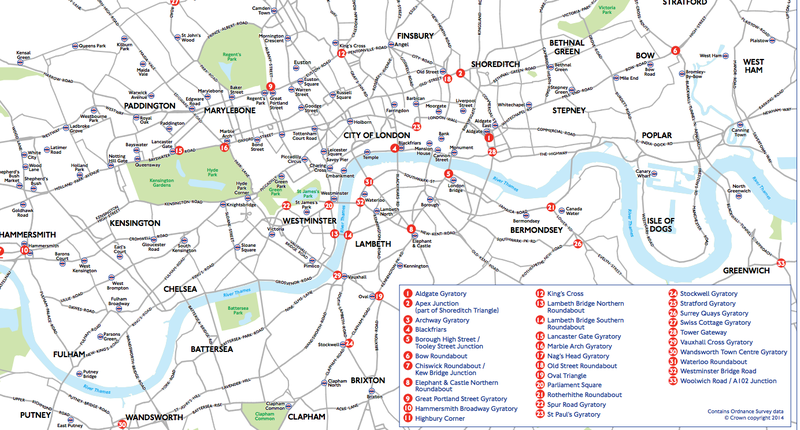 The original plan was to tinker with over 100 junctions all around London. And the original plans for those junctions were pretty rubbish – some white lines and a few signposts here and there. The schemes that were originally proposed at Oval were absolute junk, to be honest, and that was a result of not enough money to do the job properly. Whether the final list of 33 junctions is the right one or not, I think the philosophy is absolutely spot on: Rather than tinker with 100 or so junctions and get it wrong, pile proper resources into 33 junctions and get them right. If you can really (and I mean really) sort out the windswept grimness of Vauxhall or the choking misery of Marble Arch and make them places where your average person actually feels that cycling looks safe and sensible, then, in my view, you’ll have achieved a load more than some flimsy advisory bike lanes would ever do. I’m really encouraged by this news but I’m also impatient to see real facts on the ground. We’ve been promised snazzy cycle tracks at Vauxhall for over a year. It may be another year, or who knows, even two more years, before the diggers move in. Likewise, I notice that the announcement avoids making any commitment to a delivery timetable. For example, this week, TfL announced some very half-hearted plans to make cycling a bit easier in twodirections around Kings Cross. Elements of this new scheme aren’t bad but, overall, it’s pretty weedy stuff. 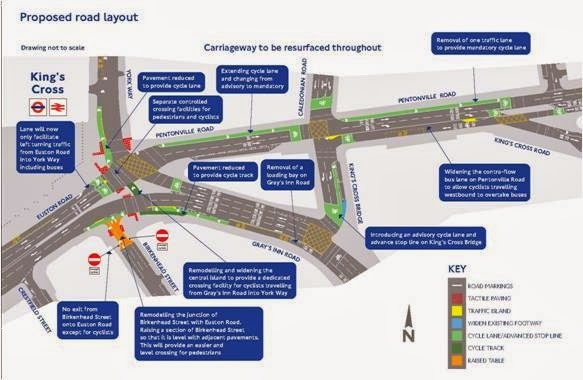 The new Kings Cross plans hint at great future changes to come (which are confirmed in the 33 junctions announcement) but there’s no indication of when this massive road system is finally going to be sorted out and made to work for people and not just for motor traffic.